At the end of last year, I got an email asking me if I wanted to go to Spain and learn a bit more about Galicia. Initial reaction, was this a joke? Secondary reaction, where the hell was Vigo? I'm a Geography graduate, so that last point was pretty embarrassing but once I realised this wasn't some sort of elaborate wind up, I keenly said yes. This was after all, my first invite abroad. And I was pretty damn excited by it. Vigo (as Google Maps swiftly revealed) is located just north of Portugal, deep in the heart of Galicia, and as it turns out, one of of the biggest fishing ports in the whole of Europe. I was slightly worried about the itinerary, containing an assortment of seafood related activities including fish markets and an outing on a fishing boat. It was Winter and I am hesitant about seafood at the best of times. But what's the point of writing this blog if it wasn't about learning? 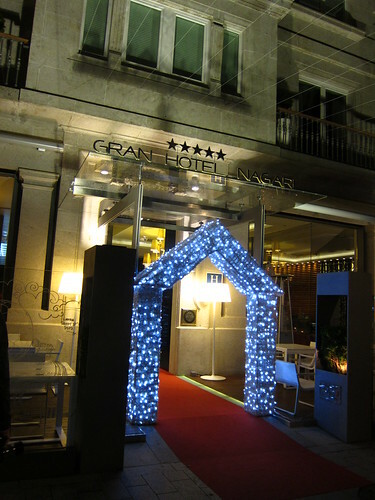 Staying in the heart of "new" Vigo, we were put up in the Gran Hotel Nagari, five star accommodation. The hotel is home to a rooftop spa boasting a grand view if Vigo. Or so it claimed. Sadly, I wasn't allowed up there so I can't really comment on how bad or good it was. 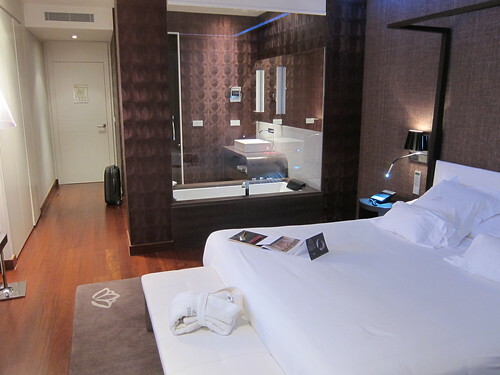 My room, on the other hand was lovely, as were the staff and the location is pretty close to the old town and Maruja Limon, the solitary Michelin starred restaurant in Vigo, and incidentally, the destination for the first night in Vigo. To start, a little about the wine of the region. Throughout the meal, we were served one white and one red, but played a few tasting games including being blindfolded and tasting at different temperatures to pick up the subtle nuances of each. 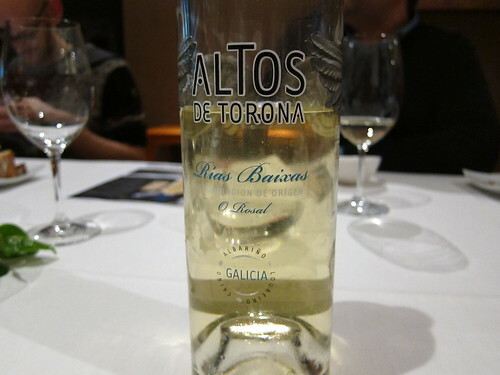 The white, an Albarino which is a grape common to the region, was the star of the show and as the focus of this meal was around the seafood of the area, matched well with many of the dishes we ate throughout the evening. The first bite of marinated tuna-esque fish set the tone, a light and fresh mouthful, swiftly followed by a delicate veal carpaccio with parmesan. 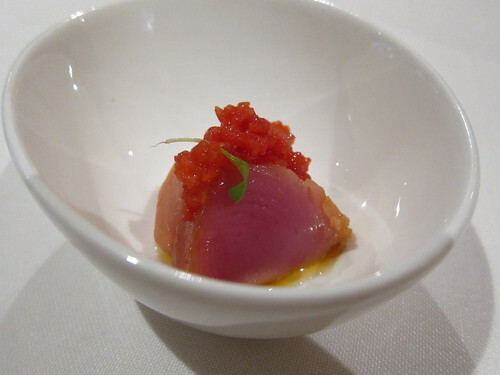 Each subtle mouthful, heightened by little accents like the mustard in the carpaccio and the diced tomato with the tuna. I'm not going to lie, I don't remember what was in every dish I ate. I have pictures, but with the limited Spanish I know, most of my memories are just that, just supported by a liberal use of Google translate. An unknown fish started the banquet in earnest, dusted with a liberal shaving of macadamia nuts. 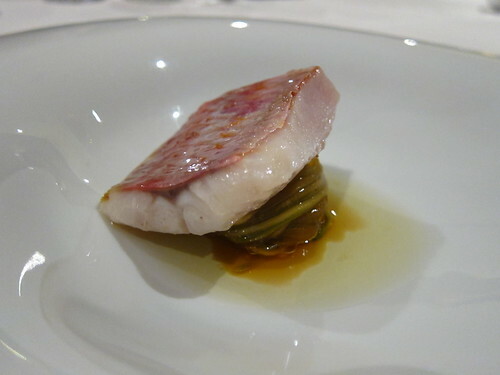 Next, a mullet dish with lightly pickled vegetables. Simple, elegant but just what the fish needed to shine. I've never really understood the fuss around fish before, as often found it bland and dull, but these dishes let the fish speak for each itself, and when it's as fresh as this, it's hard not to enjoy. The best dish of the night came next, a truffle and savoury egg custard with nuggets of bacon and mushrooms. We were urged to dig deep into our little bowls, and with each spoonful, a different balance of flavours revealed itself. A wonderful dish that left us licking our bowls. 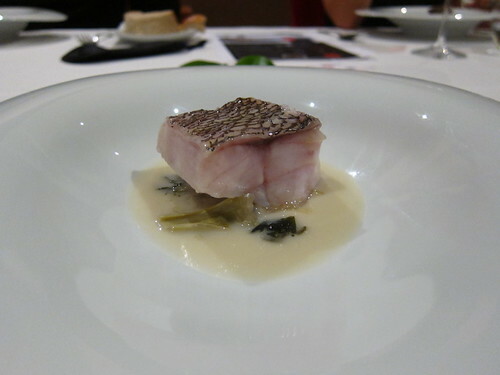 Back to another fish, this time with an artichoke and seaweed sauce. I don't remember ever having enjoyed such a fish based meal, but I guess that I have never eaten fresher, which clearly makes the difference. 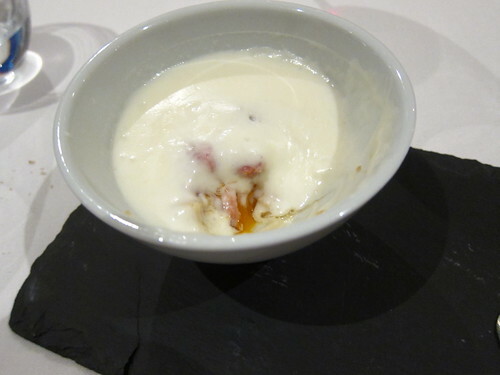 After the fish, was our final savoury course, an odd combination of sweetbreads and grapes in a cheese sauce. Put simply, I have never enjoyed sweetbreads. I put them up their in the league of the devil alongside anchovies. The texture, the fattiness and the aftertaste are all too challenging for me and this dish sadly did nothing to change my mind. The desserts were extraordinary. 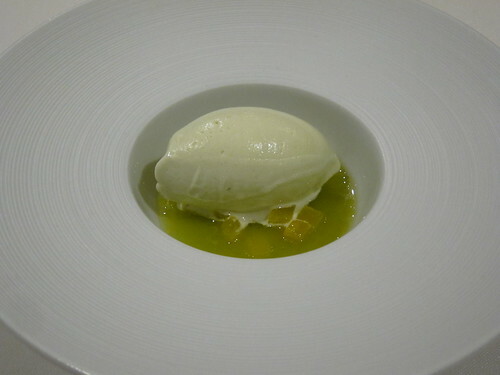 A sorbet of green apple had such surprising clarity of flavour, and paired with celery, pineapple and tangerine in a juice with a slight savoury tang left me yearning more. 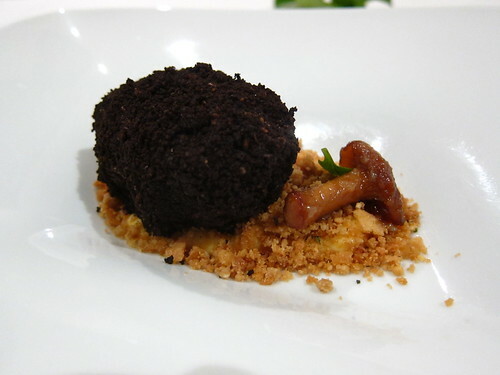 A final dessert of "False truffle" arrived looking like a rather large summer truffle. Inside, a chocolate truffle, completing the witty play on on words. A joke doesn't really work if it doesn't eat well, but there was nothing funny about this. This was a serious dessert. 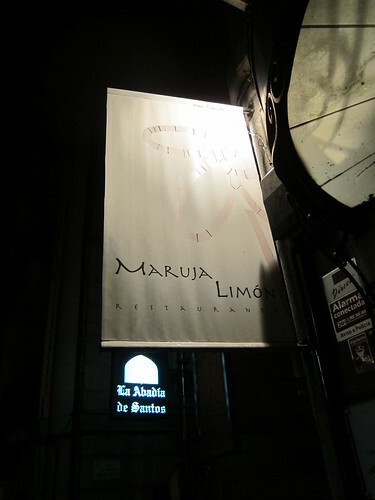 On reflection, the whole meal at Maruja Limon was extraordinary. 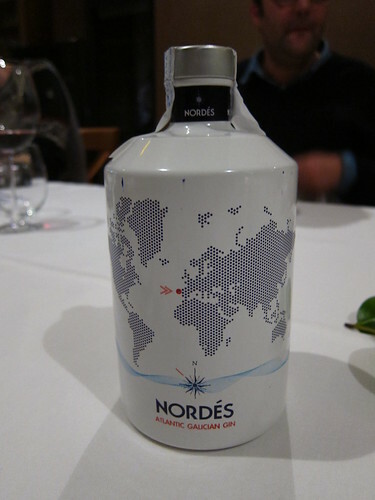 I learnt a little about the wine of Galicia and it's subtle nuances, I learnt a little about the different types of fish and its individual flavours, I even got to try a sip of the first Galician gin, but most of all, I learnt that there is nothing quite like a fresh fish supper. So day 1 was a great introduction to Vigo. A wonderful meal and a wonderful hotel. 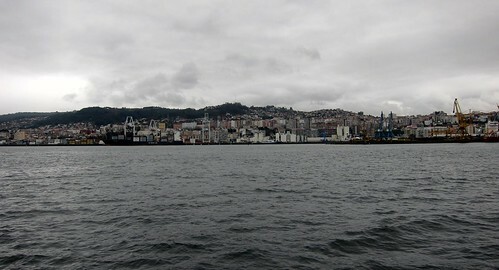 According to my agenda, day 2 was going to teach me all about the fishing trade that manifests itself everywhere in Vigo. I couldn't wait.